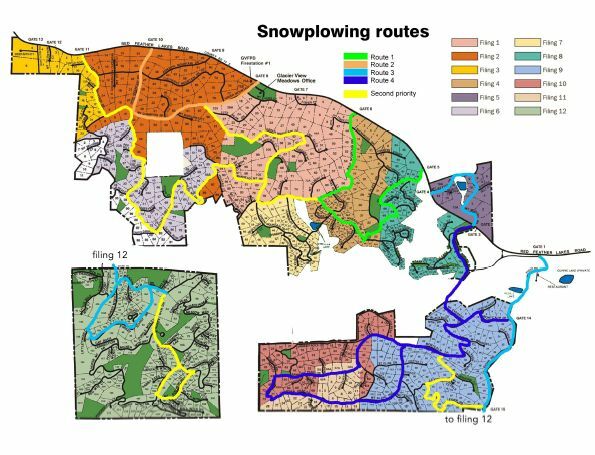 Road maintenance (grading, dragging/raking, or whatever is best suited) will be performed on the roads below twice a month from spring through the fall. (May 1 through November 30). Weather dependent/snow fall conditions will change the schedule. Other grading will be done on trouble spots and pot holes on an as-needed basis. Minimal or no maintenance will be done during the winter. 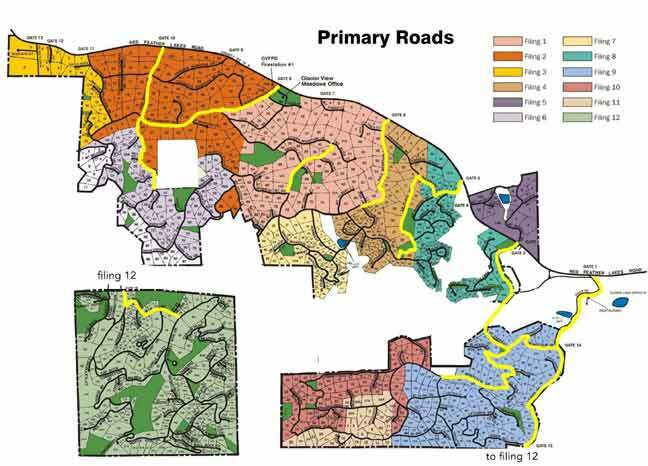 All secondary roads (roads not listed above) will be graded once in the spring and again in the fall or as needed. All courts will be graded on a as needed basis per year. Residents on any court can notify the manager that their court does not need grading that year or other new issues. This schedule may have to vary dependent on having a deep bury or an emergency project that takes our full attention. Equipment failure may also impact the schedule. 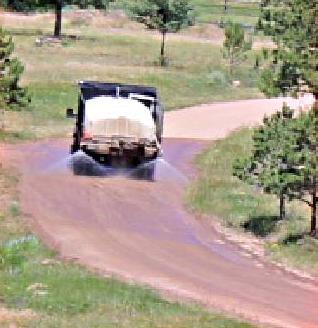 Moisture is needed for proper road maintenance. Without moisture potholes will not pack and will beat right back out. Wash boarded roads cannot be cut to make a smooth surface and the washboard will return in as short as 2 days. The binder is brought to the top while grading. The wind relocates the binder and our high-priced road base. 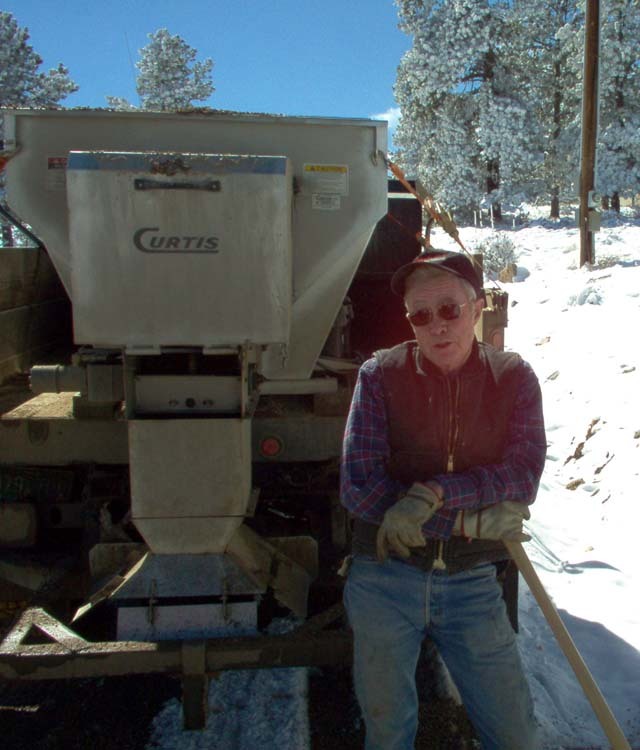 Excess grading without moisture can be wasted money and effort. Have you ever been driving through GVM and encountered the big yellow beast? The slow moving hunk of steel which threatens to make you late or possibly run you off the road? While we’re all happy to see the dreaded Road Grader at work, it represents a driving challenge for both parties. In this article, we’ll try to explain the encounter from the viewpoint of the grader operator and how to manage each encounter you have. Stop dead in the middle of the road and maybe it’ll go away. As it approaches, start backing up for 1 mile and maybe it’ll go away. Surprise attack from the rear, speed up, make no eye contact with the beast, and attempt to jump the dirt mound as you narrowly escape the blade of death. Drive confidently at the menace and blast by it as if it were a lowly 1973 VW Bug. Find the nearest driveway or road and pull off the road until it passes. Wait for a signal from the operator indicating it is safe to pass. Obviously, from the grader operator’s perspective, options E and F are the only sensible ones. The operator inside this 30,000 pound behemoth has up to 14 different adjustments to monitor not including the steering wheel and the gas and brake pedals. While the grader is cutting the road or re-spreading the road surface, stopping, turning, or worrying about your car is extremely difficult. By purposely giving the grader the right-of-way, the operator can avoid you, other road obstacles, and maintain his adjustments which prevent mistakes and unnecessary rework. Our roads are narrow and passing the grader is risky. The blade is constantly being adjusted and it may be moving outward just as you surprise it from behind. It may appear that the operator doesn’t know you are behind him, but he really does and he just can’t look at you right now. He saw you in the mirror as soon as you came up behind him and he is thinking about when he will be able to stop or move sufficiently to allow you to pass. Please don’t surprise him and wait the extra 1-2 minutes for his signal to pass from behind. 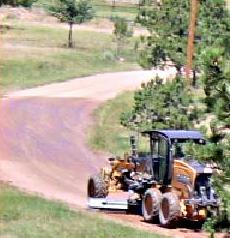 When approaching the grader from the front, simply pull far off to the road side or into another road until he passes. If you have no place to pull off, just stop and wait for a signal from the operator on when to safely pass. Understanding the complexity of the grading process and the perspective of the grader operator will help keep everyone safe when encounters occur. Next time we pass each other on the road, please keep options E and F in mind. And, a friendly wave or the traditional “thumbs up” sign always brightens our day.